Tomatoes are quite the controversial vegetable. Educated people have debated their classification in the US since the late 1800’s. Vegetables or fruits, what do you think? The biologist in me finds the answer to be undeniable. Tomatoes are very clearly (drum roll here) FRUITS. The very definition of a fruit is, and I quote from my desktop Scientific dictionary, ‘the ripened ovary of a seed plant and its contents.’ That is exactly what a tomato is my friends. So, why ARE tomatoes classified as vegetables? The 1893 US Supreme Court classified tomatoes as vegetables so that they could be taxed under the 1883 Tariff Act (10% duty on whole vegetables). Now, it all makes sense – right? Interested? Tomatoes require full or part Sun (though most say they require full sun or 6 hours of direct sunlight) and lots of water to grow well. You can plant tomatoes in the ground or grow them in containers. You should carefully consider the height of your tomato plant and the size of your container before planting. Bury young tomato plants deeper than the container you buy them in. You can even leave just the few top leaves above the ground. Tomatoes are able to develop roots all along their stems, so this helps create a strong tomato plant. You can also dig a hole wider than it is deep to accommodate a tomato plant lying on its side. The plant will grow up toward the sun and straighten itself out. Tomato plants definitely need fertilizer and if you plan to eat them (why would you grow them if you didn’t?) we recommend an organic fertilizer like Microlife. During heavy fruit production, apply Microlife more frequently. Lots of folks have their own magical tomato fertilizer concoctions. Just remember, fruits are what they eat. What? In other words, if you use stinky fertilizers, your fruit can sometimes take on that flavor. Yuck. 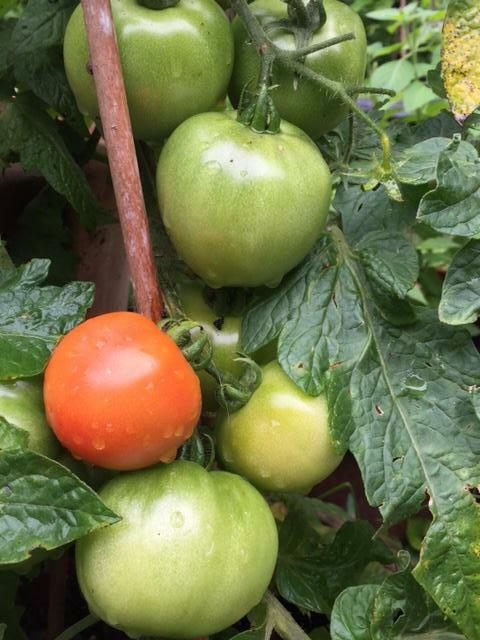 Hold off on mulching tomato plants until the summer heat really starts to cause a problem with moisture for your tomatoes. You want the soil to “heat” start your tomato plants – they like it hot! Tomato plants can be determinate (bears all fruit at one time) or indeterminate (bears fruit through the whole growing season). Determinate tomato plants will stop growing when they start bearing fruit. Indeterminate tomato plants can continue to grow as they produce fruit through the whole season. Caging tomatoes is important. Some tomato fruits are HEAVY. The largest recorded was over 7lbs. Yours probably won’t grow to the size of a cantaloupe, but you never know. So, use a cage from the very beginning. The tomato plant will appreciate the assistance and could possibly bear more fruit if supported. You can remove the bottom leaves off a tomato plant once the whole plant gets pretty close to its normal height. These leaves get very little sun and are usually the ones to start fungal issues for the entire plant. You can also thin the leaves to allow more sun to reach the tomatoes, but remember, the plant needs leaves for photosynthesis. Lastly, you can remove the small growths that pop up between branches. These won’t bear fruit and just take energy away from growth or fruit production. I am always intrigued to find out about the brave souls who first ate those exotic and interesting foods that came from far away. We should pay homage to those who did not make a wise choice (moment of silence here). It is rumored that Mr. Robert Gibbon Johnson did us all a favor when he ate an entire basket full of bright red delicacies brought over to New Jersey from Europe in the early 1800s. Folklore says he did it just to prove to the crowds the tomato fruits weren’t poisonous. Good thing he didn’t eat any of the leaves! Eggplants are an easy to grow vegetable for our area. They need a warm sunny spot in the garden and room to grow. You can grow eggplants in containers or in raised bed gardens. They do better in raised beds because the soil warms faster for quicker maturity of plants and fruit. Eggplants like a slightly acidic soil with a ph of 6.3 to 6.8. Eggplants need water to produce plump fruit. Mulching your plants will help retain water for your garden and keep your eggplants healthy. Eggplants range in size from 18″ to 4′. Supporting your eggplants with a small tomato cage or other support will help the plant stay strong and keep fruit from laying on the ground. Eggplants are very versatile and can be baked, broiled, sautéed or grilled depending on the variety. We carry a large variety of eggplants at Maas so you can be sure to find the type that is right for your needs. Here are some eggplant varieties we carry. Grafted for larger, stronger plants that produce bigger and longer harvests. Dusky and Ping Tung Long varieties. Heirloom variety from 1802 with dark purple/black 8″ long oblong fruit that ripens earlier than other varieties. 2′ to 3′ high and 18″ wide. Asian variety with purple striped, oval fruit with delicate mild flavor. Harvest early at 2″ or mature at 4″ x 2 3/4″. High yielding, spineless plants are 24″ to 30″ in height and 12″ to 18″ wide. Pure white, oblong 5″ to 7″ full size fruit that are sweet with no bitterness. Very disease resistant. A pretty plant in the garden. Semi cylindrical, non bitter, deep pink fruit on strong, high yielding plant. 2008 All American Selection with clusters of 3 to 6 deep purple fruit ranging from3″ to 10″ long. Perfect fot sautéing. Up to 3′ in height and almost 3′ in width. Dark purple 10″ long fruit on large plants. Very popular in restaurants. Great for grilling and roasting. 3′ to 4′ in height and 2′ to 3′ wide. High yielding southern heirloom with light green 8″ to 9″ long cylindrical fruit. Rich nutty flavor. Tall plants produce high yields. Spacing – 2′ to 3′. In Season: Bell peppers are available year-round, but they’re at their best — and most abundant — from July through November. How to Store: Store in a paper bag in the crisper up to five days. Grow peppers in full sun (at least 6 hours per day) in soil that is rich in organic matter, moisture retentive but well draining. Choose a site protected from wind. Keep peppers evenly moist but not wet particularly when blossoms appear and fruit begin to form. Soil that goes too dry can result in flower drop. Keep the soil evenly moist just after transplanting peppers to the garden; avoid under or over watering peppers early on. Add aged compost to planting beds before planting and again at midseason. Tomatoes are quite the controversial vegetable. Educated people have debated their classification in the US since the late 1800’s. Vegetables or fruits, what do you think? The biologist in me finds the answer to be undeniable. Tomatoes are very clearly (drum roll here) FRUITS. The very definition of fruit is, and I quote from my desktop Scientific dictionary, ‘the ripened ovary of a seed plant and its contents.’ That is exactly what a tomato is my friends. So, why ARE tomatoes classified as vegetables? The 1893 US Supreme Court classified tomatoes as vegetables so that they could be taxed under the 1883 Tariff Act (10% duty on whole vegetables). Now, it all makes sense – right? Interested? C heck out this Mental Floss link. I found this article interesting ­A Typology of Culinary Fakelore at the following link: http://www.foodhistorynews.com/debunk.html. You might too if you have an interest in culinary trivia or folklore. horrendous and our rain is much more regular. We don’t swelter in the summer heat and neither do the things we plant. Vegetable gardening is much more enjoyable in winter and there are lots of vegetables that like cooler weather. My personal favorite fall and winter veggie is lettuce. I absolutely love growing lettuce from seed. The combination of types and varieties of lettuce seeds provide endless combinations of taste and color. No grocery store lettuce can compare with home grown lettuce. No bland, pale iceberg lettuce for me in the winter. My front and back flower beds, containers, and vegetable garden are brimming with greens. Lettuce also makes a great annual edible border. I even have a few neighbors jumping on the edible landscaping bandwagon. 1. Crisphead – forms a firm head with a crisp texture. Lettuce found in grocery stores. 2. Butterhead – Forms a tight rosette with a softer texture. 3. Looseleaf – forms a bunch instead of a head.Will resprout from a cut leaf. 4. Cos or Romaine – Upright lettuce with long, narrow leaves. After you have chosen your seed there a 3 tricks to growing lettuce. The first requirement for lettuce seed is light. Lettuce seeds are photosensitive which means they need light to germinate. Make sure that the soil where you plant your seed is smooth and loose. I put an inch or two of earthworm castings or germinating mix on top of my soil to make a good base for my seeds. Press the seeds in the dirt so that they make good contact with the soil. Lightly cover the seeds with about 1/4 an inch of soil. Because lettuce seeds are small, using a seed sower to help you place your seeds can speed up this process. The second trick to know about lettuce seed germination is that the seeds are also temperature sensitive. If temperatures are 80 degrees or above lettuce seeds will not germinate. This makes our fall and winter perfect for lettuce. These seeds will germinate even if the temperatures are in the 40 degree range. Last but not least, lettuce seed must stay moist. If the seeds dry out during sprouting they will not make it. Because I like to grow lettuce in containers, I plant my seed and mist them gently, then cover my pots with saran wrap. You can achieve the same effect in the garden by covering the seeds with clear plastic cups or tent saran over your seeds. With the right light, temperature and moisture you should have lettuce coming up in no time. Once your seeds germinate there are very few pests to worry about. Snails, slugs and caterpillars are the worst culprits but they can be easily controlled with bait or removing them by hand. Lettuce can get aphids. If you find aphids, spray them off with water or use a blast of insecticidal soap to get rid of them. Simple! Harvesting lettuce is easy. Harvest crisphead and butterhead lettuce when the heads have formed. Cut the plant off at the soil line. If the head starts to elongate harvest immediately. Elongated heads means the lettuce is bolting and that will turn your harvest bitter. Looseleaf and romaine lettuce can be harvested completely or you can harvest a few outer leaves at a time. These leaves will grow back giving you a continual harvest. We have a large selection of lettuce seeds here at Maas. Come and see us and we will be happy to help you start your winter green garden. Collard Greens, like Mustard Greens are loose leaf cultivates of Brassica Oleracea. They have large dark colored edible leaves. They can grow to 2 feet wide and 2 feet tall. They prefer cooler weather in a fall or winter garden. Collards and Mustard Greens like full sun and well drained soil. They are very easy to grow. Originally cultivated by the Ancient Greeks, they are a popular southern staple. Both are cruciferous vegetables with many healthful benefits. They both have Cholesterol lowering benefits and cancer preventative properties. Collards and Mustard Greens are a good source of soluble fiber and omega-3 fatty acids. Both greens support the function of several bodily systems including the Detox System, the Antioxidant System and the Anti-inflammatory System. Greens are also a good source of Vitamins C, K, and A. Collards are best and most healthful when steamed for 5 minutes. Mustard Greens are best and most healthful when sautéed in some broth or olive oil. Two to three servings a week would be ideal. Eat your greens! Nothing tastes as good as a fresh grown carrot just pulled from the garden. Carrots are a great winter crop for our area. Seeds can be sown from early fall, into the winter and early spring. It is easiest and best to grow carrots from seed. Carrot varieties are seemingly endless with colors from white and yellow to purple and shapes from very long cones to short round balls. Like all other vegetables, certain varieties do better in our climate and thick gumbo soil. The first cultivated carrots were Asian and purple in color. The Dutch developed the deep orange carrot and it quickly became the most popular carrot to grow. There are several types of carrots that do well here. The Nantes variety of carrot is the easiest for the home gardener. They perform better in our heavy soil and do not twist or fork. Chantenay carrots also do well in heavy soils. They are short and stout growing to 6 or 7 inches. Imperator carrots are the classic carrot you see in the grocery store. They can be grown in our region but the soil must be amended and tilled to at least a foot deep. Mini carrot varieties are great for containers. We carry several varieties of carrots that can be grown in pots. Growing carrots from seed is not hard if you follow a few rules. Finely tilled soil is a must for carrots. Fine soil allows the carrot to develop without forking or misshaping. Till your garden to the depth of the carrot length or a little deeper. For Nantes and Chantenay carrots this is 6 to 8 inches deep. Make sure your soil has good drainage. Adding some sand and compost can help. All root vegetables perform better when seeds are planted directly in the garden. Sow carrot seeds 1/4 in. deep in rows 1 foot apart. Cover seeds lightly with very fine ground mulch. Mulch helps retain water which is essential for seed germination. Carrots take 10 days to germinate in warm weather and up to 3 weeks in the cold. You can sow seeds in 2 to 3 week intervals to have carrots all through the winter. Carrots must be watered evenly and from above. Drip irrigation does not work well with carrots. Make sure your carrot seeds stay evenly moist at all times. Water is very important for carrot size and formation. After your seeds germinate and are 1 in. to 1 1/2 in. tall they need to be thinned to 1 1/2 in apart. This is best accomplished by using scissors to cut off extra plants and not disturb roots of remaining carrots. Carrots need space to develop so thinning the seedlings is very important. A good rule for spacing carrots is 3 in. apart in every direction. When carrots are 3 to 4 in. high a final round of thinning may be necessary. Once your seedlings are 4 in. tall all that is required of you is regular water and some weeding. Carrots will be ready to harvest in 60 to 70 days. Harvesting carrots is easy. When carrot leaves are 4 to 6 in. high you can harvest them as baby carrots. For full grown carrots give them another month after harvesting baby carrots. Be sure to give your carrots plenty of water at this stage because they are developing quickly. There are all kinds of tips and tricks to growing carrots. There are as many techniques as there are gardeners. I could continue this article for pages but I think I need to stop. I found a great website while researching this article. The name of the website is, Grow-it-organically.com. It has more carrot info and lots of other good advice on soil and organic gardening. Come by Maas and get some carrot seeds for your garden. They are fun to grow, great to eat and very good for you.